Nicer than I expected. Bought it as a gift for my son and he was as pleased as I was. Solid, quality made. Dishwasher safe, very attractive. ZWILLING J.A. Henckels is a manufacturer of cutlery and cookware since 1731. We manufacturer premium German cutlery under the brand ZWILLING J.A. Henckels, premium Japanese cutlery under the brand Miyabi, premium Belgian stainless steel cookware under the brand Demeyere, premium aluminum Italian cookware under the name Ballarini, premium French cast iron cookware under the brand Staub, and entry level cutlery under the brand J.A. Henckels International. For customer service inquiries or to initiate a return, please contact ZWILLING J.A. Henckels at zwillingonline@zwillingus.com or 800-777-4308. You can initiate a return for most new and unopened items within 30 days from delivery for a full refund. You must return items in new or unused condition with all original materials included in the shipment. We inspect all returned items and award a partial refund for opened or used products. We must receive your returned items at our processing facility within 45 days from delivery. For fulfillment errors and/or defects, you will be provided with a return shipping label from Overstock.com. 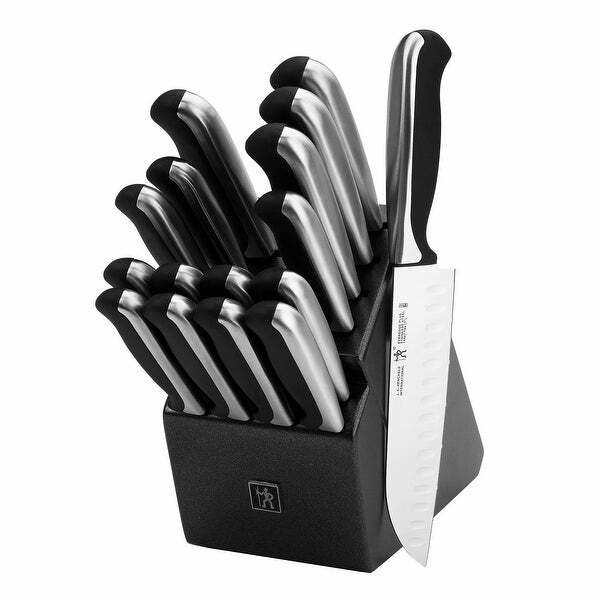 The Henckels International Everedge Plus 17-pc Knife Block Set gives home chefs high quality, low maintenance knives to accomplish everyday tasks with ease. Thanks to their handy micro-serrated edge, the blades never need to be sharpened because the cutting edge between the points do not come in contact with the cutting board. The all-rounder 8" Chef's Knife is ideal for chopping herbs and dicing onions while the 5" Serrated Tomato Knife cleanly slices through tomatoes. Perfectly peel apples with the small 2.75" Paring Knife. Fabricated from superior stainless steel, these knives provide long-lasting durability. Enjoy maximum maneuverability with the full tang and single-piece stamped blade construction, which is lighter than forged knives. Enjoy tireless cutting with the comfortable, soft grip handles. With their elegant stainless steel backing, Everedge Plus handles look as good as they feel. Henckels International makes essential kitchen tools every home chef needs. From steak knives to spatulas, every product offers high quality at an exceptional value. Created in 1895 by Zwilling J.A. Henckels, this value-driven brand guarantees the same durability, design and ease of use for which the global company is known. Equip your kitchen with expertise with Henckels International. This Everedge Plus 17 piece Knife Block Set is unique in that you do not have to sharpen the knives. The edges are micro serrated so that they never have to be sharpened. I am learning how to use them because the cutting action is a little different from the plain edge knives. JA Henckels International make them so they have to be perfect. We purchased this cutlery to have as an extra set. They are nice and sharp but a little lighter in weight than I prefer. Also, the edges on every single knife is serrated.... I’m not talking jawtooth serration, but almost microscopic... every single one. They still cut nicely but they do not leave a smooth cut, as desired with some good preparation. Overall, it’s a good deal for your money. This is a Christmas gift for my daughter. I've checked prices, sets and manufacturers in person and on several sites. I picked this one because of style and value. Not only lots of chef knives but 8 steak knives. She'll love it and it will look fab on her kitchen counter! This set seems to be very high quality. It has a great look to the set and the knives are very sharp. I heard Henckel's was the best, so hopefully after more use I can agree!